As a shocking report reveals that a ‘suspected model aircraft’ flew just 20ft from a passenger jet at Heathrow, AP looks at the advice available when buying a drone, as safety fears grow. With more than half of Amateur Photographer (AP) readers in a recent survey saying they want to try their hand at drone photography, perhaps it’s not surprising that the unmanned devices have been dubbed a ‘must-have’ Christmas gift. AP has learned that sales at the consumer electronics chain Maplin have soared 450% in the past few weeks, and online retailer Firebox says demand has trebled since last year as they become ‘more affordable and accessible’. Drone safety has been called into question recently, and comes as an official report into an incident at Heathrow over the summer today reveals, alarmingly, that an ‘unidentified model helicopter’ came within ‘20ft’ of the wing of a plane as it came into land. The incident occurred on 22 July 2014, at 2.16pm. The A320 pilot reported the following to the UK Airprox Board: ‘He stated that a small black object was seen to the left of the aircraft as they passed 700ft in the descent, which passed about 20ft over the wing. ‘It appeared to be a small radio-controlled helicopter. The device did not appear on radar. Though a drone operator is ultimately responsible for his or her device, AP wondered what safety guidance is available to a wannabe drone ‘pilot’. Oliver Meakin, managing director at Maplin Direct, said: ‘Some concerns have been raised about consumers buying drones and being unaware of the regulations. ‘Maplin has asked its main suppliers to include a leaflet covering the appropriate regulations, as well as training all store colleagues to advise customers of their responsibilities’ (see link below). 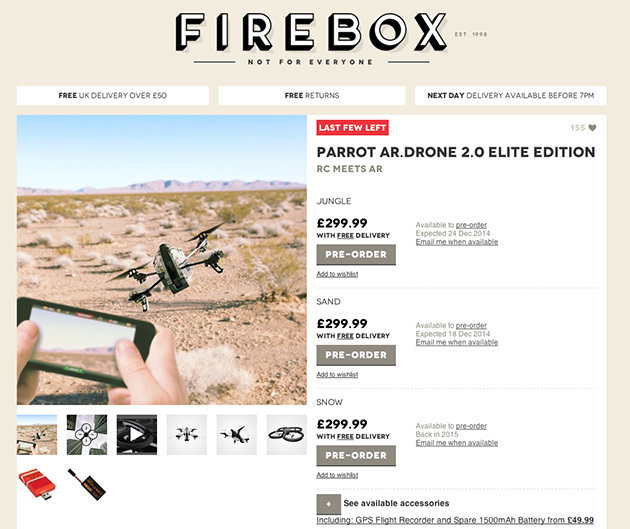 Firebox’s most popular drone is the Parrot AR Drone 2.0 Elite Edition, costing around £300, one of three models it sells. Parrot says it supplies a ‘quick start’ guide with all its drones, containing basic information on where, and how, people can and can’t fly them. The Parrot Rolling Spider, which houses a built-in camera, can be controlled from up to 20m away, using a smartphone. Guidance supplied with the £90 ‘minidrone’ states it is only designed for ‘recreation, entertainment and competitions between model aircraft’. The guidance adds: ‘The use of the Parrot Rolling Spider in some public areas (for instance, train stations, trains, airports, aircraft, etc.) may be prohibited. Advice for the larger AR Drone 2.0 adds that its use for ‘surveillance or espionage is strictly forbidden and could result in your prosecution under the law’. However, Parrot’s guidance falls short of outlining the specific distance safety regulations, as laid down by the UK’s air regulator. That said, a Parrot customer helpline is available for people unclear of the rules. 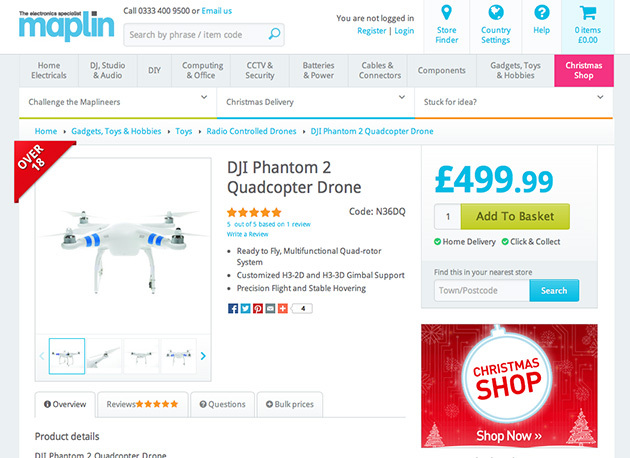 Electronics retailer Maplin operates more than 200 stores across the UK and Ireland, selling a range of drones including the popular DJI Phantom quadcopter, costing around £370. Posing as a prospective customer, AP’s news editor contacted Maplin, seeking safety advice after spotting one in the window of a store on the Strand in London. He asked: ‘I am thinking of ordering a DJI drone for Christmas after seeing one in the window of one of your stores, but I wondered what the rules are on using them? ‘Do I need a licence and/or permission from anyone to operate a drone and what are the safety rules, if any? In response, a customer service advisor provided a link to the chain’s guide to ‘Responsible flying of Remote Controlled Aircraft’. 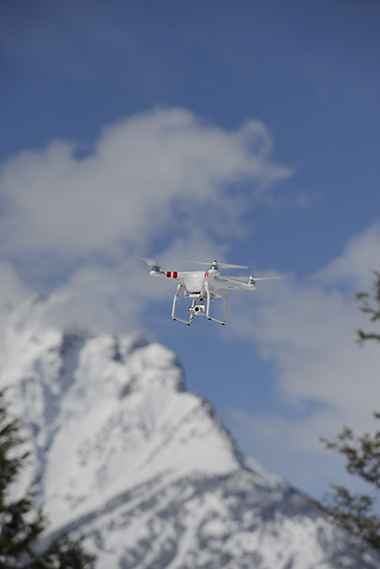 The guide makes clear that the drone must be within the pilot’s sight at all times. ‘You are responsible for avoiding collisions with other people or objects – including aircraft, plan your flights beforehand if necessary. ‘You must keep your drone at least 150m away from a congested area (such as residential streets, town centres etc]. Demand for drones is set to rise further in coming months, said Ben Redhead, head of buying at Firebox.com, who predicts that media coverage over privacy concerns will boost sales by keeping them in the public eye. Maplin Direct’s MD added: ‘Along with creating a new twist on film footage, people are clearly taking a keen interest in drones for photography purposes as it allows a new angle on producing never-seen-before images. The Civil Aviation Authority (CAA) this week told AP it has already seen ‘significant interest’ from members of the public asking whether they need permission to fly one, which, provided they are not used commercially, they don’t. There are tough penalties, though, for breaking the rules. A drone user can face paying a heavy fine, and thousands in court costs, if they break the civil aviation laws, which are underpinned by the Air Navigation Order. Unsurprisingly, if a drone puts an aircraft in danger, the operator could end up in prison. Earlier this year, Robert Knowles was fined £800 for flying a home-made drone near a bridge in Cumbria. He was also found to have flown the device in restricted airspace over a nuclear submarine facility. The CAA was awarded £3,500 costs over the incident, which occurred in the summer of 2013. Knowles, from Barrow-in-Furness, became the first person in the UK to be successfully prosecuted for the dangerous and illegal flying of an unmanned aircraft. ‘Breaching some of these rules may only result in a fine, while others – such as “recklessly endangering an aircraft” – can result in a custodial sentence,’ a CAA spokesman told AP. Police analysed video footage taken by a camera fitted to the drone used by Knowles and found it had flown over the busy Jubilee Bridge in Barrow-in-Furness, and ‘well within the legally permitted 50 metres separation distance required’, before landing in water. Last year, a photographer from Lancashire was cautioned for using a drone for commercial gain without permission. He had sold quadcopter footage of a school fire to media organisations. Meanwhile, a drone carrying a camera and mistletoe recently injured a photojournalist inside a TGI Friday restaurant in New York, reported the Brooklyn Daily. The TGI Friday drones are apparently designed to encourage dining couples to kiss. In AP’s survey, 241 of the 406 respondents said they would like to try drone photography if they had the chance. AP approached Currys, which also sells drones, but no one was able to comment at the time of writing.